This year's varsity boys' basketball roster comprised only 14 players and among them just four seniors. As the season opened, no one was sure how far the Knights would go. As the months unfolded, however, Coach Mergin Sina’s team proved its depth, with contributions coming from the core group of upperclassmen and a talented cadre of freshmen and sophomores. As if to silence naysayers, in a 70-53 opening night win over Watchung Hills, freshmen and sophomores led the scoring: Jake Betlow '19 racked up 22, including 5 three-pointers, followed by Alex Schachne '18 who posted 15 and Paul Mulcahy '19 with 10. Over the next three contests, it would be a senior, Adam Mitola, who would take the lead in scoring, garnering 19 points in a 64-52 victory over Teaneck, 23 in a win over Franklin, and 24 in a victory over Plainfield. With scoring coming from throughout the roster, the Knights tacked on wins over Immaculate Conception and Patterson East to close out December 6-0. The New Year opened with wins over Ridge High and long-time rival Rutgers Prep. On January 17, despite 26 points from Mitola, the boys suffered a tough 62-66 loss to Roselle Catholic. The Knights returned strong the following week, with a decisive 62-26 win over Hillsborough. A true team effort, 11 players contributed points, with junior Michael Morreale leading the way with 15. The team rounded out January with three additional wins, including a victory over Bedford Academy in which Betlow hit 8 three-pointers. The first three games of February brought wins over Ridge, Franklin and Bridgewater Raritan. Steady contributions from senior Connor Klementowicz, who posted 24 points over the three games, helped pave the way. Senior Julius Stoma garnered 11 in the close 55-50 matchup against Bridgewater Raritan. After disappointing losses to Seton Hall Prep and Hunterdon Central, the team added six wins and a Somerset County championship. In the SC quarterfinals on February 18, the boys bested Bound Brook 76-47, and then defeated Ridge 57-38 in the semifinals on February 20. The solid play of Scott Begane '18, Andre Noll '16 and Evan Storch '17 contributed to those wins. 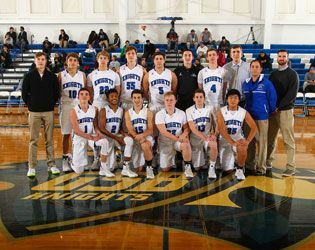 In the championship game on February 27, the team defeated Somerville High 66-51, earning its second consecutive Somerset County title. Betlow posted 21 points, including 7 three-pointers, and Mitola and Moreale added 12 apiece. The Knights launched into March, with a decisive 89-52 win over Immaculata in the opening round of the NJSIAA Non Public B tournament. A true team effort, 12 players contributed baskets. Mulcahy led the scoring with 24, followed by Mitola and Klementowicz with 13 apiece. In the sectional quarterfinals, the team defeated Wildwood Catholic 56-40, with Mulcahy garnering a team-high of 13 rebounds. In the sectional semifinals against Mater Dei, a layup from Stoma in the final minutes brought the score to 54-51 and a Mitola rebound iced the game. The season ended with a loss to Roselle Catholic in the state sectional finals. Looking ahead, the team will miss the raw scoring power of Mitola and the versatility of Klementowicz, who could be counted on for points, steals and assists. Over this season, Stoma was a reliable and steady part of the offense, and Noll became an increasingly important contributor as the season progressed. Among this year's junior lineup, Morreale, who averaged over six points per game, will be expected to play an important role on offense next season, and the team will rely increasingly on Evan Storch's ability to steal, grab rebounds and shoot. In addition, the team looks forward to the contributions of Tyler Starr, who was unable to play this season. This year's sophomores will take on larger roles next season, led by the high-scoring Schnachne, who ended the season with 222 points, and the versatile T.J. Chaney. The Knights will also see increased contributions from Begane, Daniel Wang and John Yoss next season. Boding well for the future of the program are this year’s two freshman: Betlow and Mulcahy. One of the team's top scorers, Betlow posted 367 points for the season, while Mulcahy proved a versatile player, making 265 points and 153 rebounds.